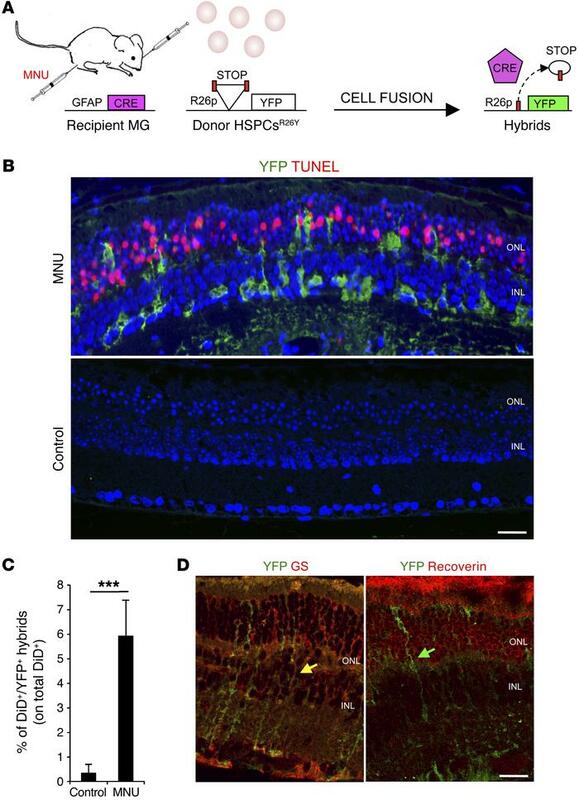 Transplanted HSPCs fuse with MG upon photoreceptor damage. (A) Schematic representation of the experimental plan. Cell fusion between HSPCs isolated from LoxP-STOP-LoxP-YFP donor mice (R26Y) and recipient Gfap-Cre MG cells leads to excision of the floxed stop codon and, in turn, to the expression of YFP. (B) Representative coimmunostaining of YFP+ hybrids (green) and TUNEL+ (red) apoptotic photoreceptors on retinal sections harvested from MNU-damaged or healthy (control) Gfap-Cre eyes 12 hours after subretinal transplantation of HSPCsR26Y. YFP+ hybrids (green) derived from cell fusion are detected in MNU-damaged retinas, which show TUNEL+ photoreceptors in the ONL, but not in the undamaged eyes (control). Nuclei were counterstained with DAPI (blue). Scale bar: 20 μm. n = 3. (C) Statistical analysis of the percentage of DiD+YFP+ hybrids evaluated on the total amount of DiD-labeled HSPCsR26Y detected by FACS analysis in MNU-damaged or healthy (control) Gfap-Cre retinas 24 hours after transplantation. Data are represented as mean ± SD of 3 independent experiments. n = 3. ***P < 0.0001 by unpaired Student’s t test. (D) Representative immunostaining of YFP+ hybrids (green) also positive for the MG marker (GS, red; yellow arrows) but not for the photoreceptor marker recoverin (red; green arrow) detected 24 hours after transplantation of HSPCsR26Y in MNU-damaged Gfap-Cre retinas. Scale bar: 20 μm. n = 3.